One item I wish I had packed during an eight-week trip to Hawaii and Alaska was a hair dryer. 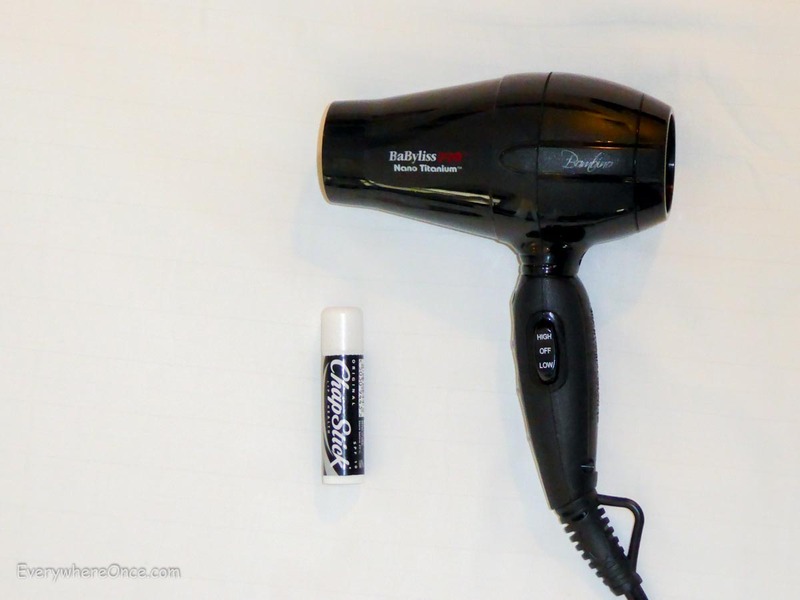 Most hotels provide them, but not all, and now that I’m living on the road I like to control whether or not I have dry hair when I want it, especially in cooler climates. I’ve had the BaByliss Pro Nano Titanium Bambino Compact Hair Dryer for a year, and it’s more than up to the task. Even if I didn’t have space constraints I would consider using this as an everyday hair dryer. The Bambino is as powerful as a good-quality, full-size model. It’s dual voltage, a must for international travelers, and the wattage is low enough that I haven’t burned out any hotel room fuses (not with this hair dryer anyway). There’s no need to bring both bath gel and a mesh scrubbie when an exfoliating soap bar does double duty. I picked up a lovely one with ground almonds at the Yorkshire Soap Company while I was in England. It lasted nearly three months, drying quickly and storing easily in a small plastic bag. (Don’t forget to remove it from the shower in between uses.) I’ll be re-stocking with one of the hundreds of varieties of exfoliating soap bars offered on Etsy.com. For a while I traveled with a wide-brimmed straw sun hat I bought in Spain because I needed one on the spot. But unless you want to wear the hat every time you pack up and move from place to place, one that can be rolled or folded is much easier to stow and carry. For my trip to Southeast Asia, I researched options and settled on the one in the picture above. It’s no longer available, but I’ve found something similar to replace it. These particular packable hats are made from grosgrain ribbon, which is attractively detailed and sturdy enough to keep its shape. 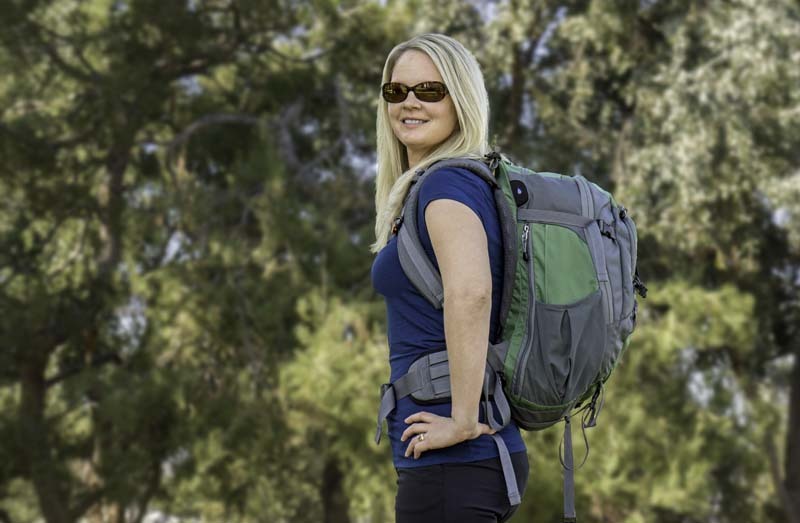 I once lamented not having enough room in my backpack to bring along a pair of shoes that wasn’t entirely functional like sneakers or sport sandals. Problem solved. These stylish, fold-up ballet flats from Butterfly Twists take up hardly any space at all. They come with their own cloth bag for storage and are comfy enough for even sensitive feet. I don’t walk miles in them, but for casual nights out with friends I have footwear that’s not frumpy. And unlike the well-known fold-up flats from Tieks, which retail for nearly $200, Butterfly Twists’ “Sophia” is a budget-friendly $40. 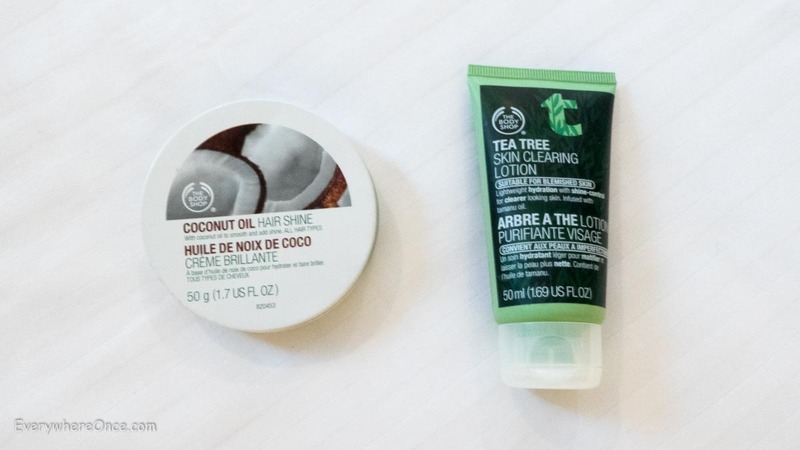 When I started traveling internationally, I switched to the Body Shop brand for some products, including their Tea Tree line so that I have consistency with facial care. If I ever run out of something on the road, chances are I’ll be able to refill it easily enough at one of their 2,500 stores worldwide. I also like the Body Shop’s Coconut Oil Hair Shine. It can be used on dry hair, as it’s intended, and also on wet locks as a leave-in conditioner. The best part is that the oil is solid, freeing up coveted space for other things in the oh-so-small, airline-regulated, carry-on liquid toiletries bag. ← Things I Miss About the U.S. I bought a very similar hat on my travels! I love the exfoliating soap and foldable flats ideas. 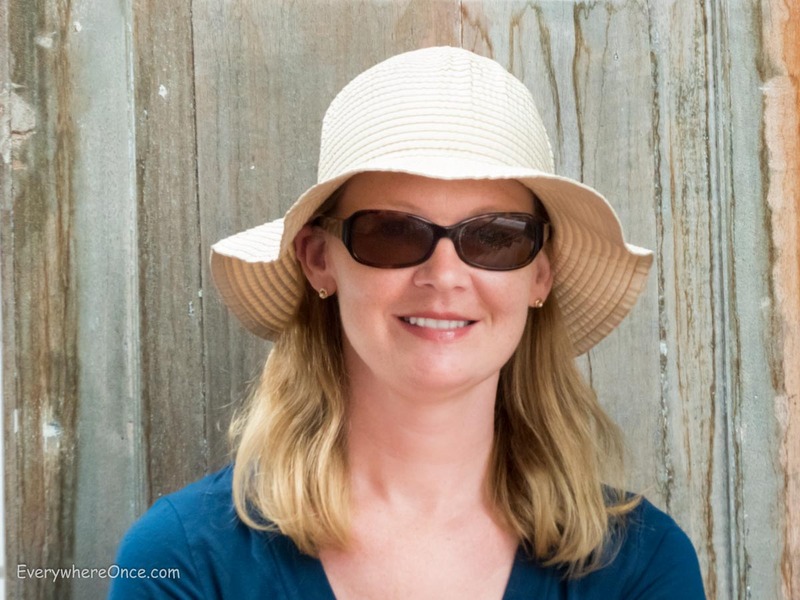 It’s funny that you mention wearing having to wear a straw-brimmed hat, as it reminds me of a friend’s story- having to wear the conical Taiwanese hat he’d bought all the way through airport security and back home to Canada! That’s hilarious about the conical hat! I wasn’t sure how the exfoliating soap would work out, but as long it dries in between uses and before being packed away it’s brilliant. In fact, even if I live somewhere permanent again I’ll probably keep using it versus shower gel and a mesh scrubbie. That’s always nice- discovering travel solutions that end up working just as well at home. You’ve probably heard of Pack Towels, but if not, I highly recommend them! Super absorbent, lightweight, tiny quick-drying towels: perfect for laundry, beach trips, showers while on the move! I haven’t heard of Pack Towels and will check them out. Thanks for the tip! I love these suggestions…things I would never think about needing when preparing for a trop. Thanks for this. Really useful ideas here! I’m getting that hat! Love the shoes too, but I have narrow feet so am always nervous about ordering shoes online as more often than not, they are too wide. And especially with Euro sizing, I really have no idea what size to order. Do you have any sizing feedback? Thanks so much — great post. I think it’s the grosgrain ribbon that really makes the difference with the hat and helps it keep its shape. That photo was taken 3.5 months into my SE Asia trip, and at that point it had been rolled and packed away dozens of times, at least, with all of the day use it gets in and out of my handbag. For the shoes, I wear a size 8 US (39 EU / 6 UK). The Butterfly Twists fit me fine, although I would say overall they probably run a bit on the small side. There is elastic all around the top of the shoe, which helps mold it to the foot but without rubbing. It seems like an easy thing to leave out, but I admit I’m much happier having it along. My hair takes hours to air dry, which can be unpleasant on a daily basis. And the Bambino really is quite compact. I second the no more bad hair days! the foldable flats would save so much space! Rereading this while considering my next trip. I’m interested in the hair dryer, as I suspect my room in the LSE dorm in London won’t have one, but I’m wondering whether the handle folds. If not, I might be better off with its ultra-lightweight sibling. The handle doesn’t fold on this model, but I haven’t found that to be an issue. If you do go with the other one, please let me know what you think of it. If it saves even more space, I’m there! I wound up buying a Braun Satin Hair 1 in Berlin (at a large housewares store in a mall, not in KaDeWa where it was more expensive!). Foldable handle, about the same size as yours, I would think. Only problem for me, it has a northern European plug, so I need a northern to southern or UK adapter – my supposedly universal adapter (bought in Lisbon) wouldn’t take it. It works better than a lot of hotel hair dryers.